Voskhod-3, the source of the rumor mill of March 1966? Was there a countdown in March 1966 to launch Voskhod-3? The launching of the dog-carrying Kosmos 110 in February 1966 signaled the start of a period of intense rumors about a Soviet manned spaceflight. The rumors, in my opinion, were the most intense and long-lived ever in the history of the Soviet space program and are the only rumors of any significance that did not result in any information in the public domain about an actual launch. February 24, 1966, when the Swedish Daily DAGENS NYHETER carried a story reporting a flood of rumors in Moscow started after the launching of Cosmos 110. According to the story unofficial, but well-informed, circles in Moscow indicated that two spaceships would be launched in early March, each carrying several cosmonauts. The flights would last long, maybe up to a month. Saturday, March 5, 1996. In a letter to Geoff Perry dated on this day, I wrote: "….Here is a note which is a little late I'm afraid. According to the Moscow correspondent of this country's largest morning paper DAGENS NYHETER (which means Today's News) the Russians will try to orbit three cosmonauts on Sunday the 6 th of March. The first shot will be followed by another ship containing two or three cosmonauts. These ships will rendezvous and form a "Double-Troika", and stay in orbit for a month. The correspondent based his report on unofficial sources in Moscow….Even if there is no launch tomorrow this report definitely supports the theory that the Russians will orbit something manned this month. This would suit them fine because that controversial Communist Party Congress opens on March 21. I also heard a broadcast from Radio Moscow in Norwegian (easy to understand for Swedes) in which it was said that the dog-flight of Cosmos 110 pointed to manned spaceflights of a new type in the near future. Quite a clear hint, isn't it?…"
Wednesday, March 9, 1966. The Swedish newspaper Svenska Dagbladet (Swedish Daily) rumors in Moscow about an "unusual space experiment" were reported. Thursday, March 10, 1966. On this day the rumors reached a real crescendo! DAGENS NYHETER carried a story about Moscow rumors in their morning edition and at 1130 UT a Swedish news Agency (TT) report from Moscow read on Radio Sweden said that a launching could be expected shortly - possibly the same day. In the evening radio news broadcast Radio Sweden's Moscow correspondent Hans Björkegren read a telephone report shortly before 1800 UT saying that Moscow correspondents had been waiting all day for a space short and that a news team from Moscow TV had been placed on "mobile alert" at three in the morning! Unofficial reports still mentioned two spaceships according to Björkegren. Friday, March 11, 1966. According to a news report on Radio Sweden at 0900 UT rumors were still circulating in Moscow! Monday, March 14, 1966: This was my 20 th birthday and I phoned the Museum of Technology in Stockholm to apply for a job as a public guide at the Soviet Space Exhibition due to open at the museum in April (I got the job!). I talked to the museum's director Sigvard Strandh who had just returned for negotiations with the Russians in Moscow (the Academy of Sciences) the previous week. He told me that he had been told that a countdown had been underway during the Thursday (March 10) but that a blizzard in Kazakhstan had prevented a launching. The Academy of Sciences had issued invitations for a press conference in the afternoon, but it was hastily canceled, he said. Saturday, March 19, 1966: According to an AFP report from Moscow the spaceshot had been postponed until the end of the Party Congress for propaganda reasons. The spaceflight could detract public attention from the Party Congress, officials feared! April 5, 1966: Luna 10 is reported to have played the "International" to the Party Congress, and rumors still abound in Moscow about a launching of a manned spaceflight at the end of the Congress! April 12, 1966: More rumors, this time relayed in Sweden by the evening paper AFTONBLADET. The rumors this time talked about two or three cosmonauts in space for up to three weeks. The report also said that the launching was intended to have taken place during the now-finished Party Congress but was canceled at the last moment. What really did happen? Were there preparations for a launch? What is behind the typical Soviet subterfuge of "a blizzard" preventing something…? "As for the Voskhod program, Belyayev revealed at the press conference that a two-man Voskhod could orbit the Earth for a month. It could also manoeuvre in space and change orbit. Although this was not realized at the time, Belyayev was in fact describing the next two Voskhod missions. Voskhod 3 was planned as a two-week to month-long, two-man flight to coincide with the party Congress scheduled for March 1966. A crew was trained to fly it: Boris Volynov and Georgi Shonin. 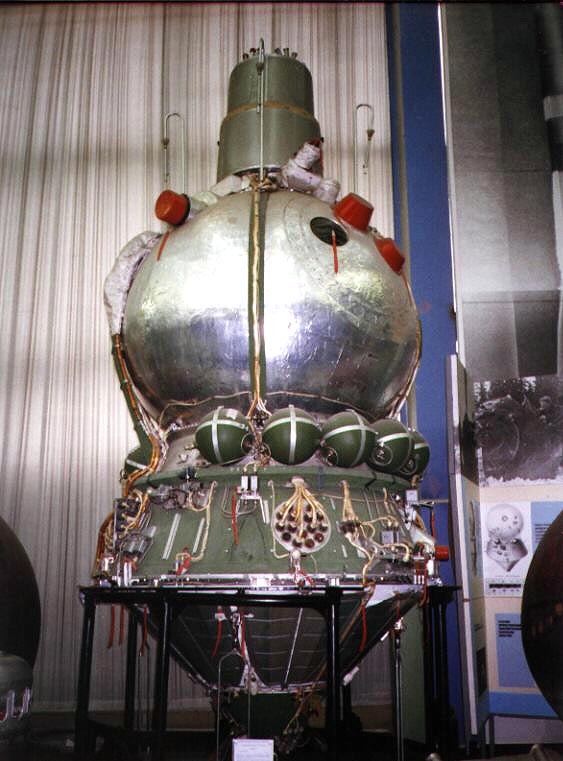 The Voskhod 4 spacecraft, which was designed for space rendezvous would have linked up with another unmanned spaceship. Also in the pipeline was a second biomedical flight of two weeks, in which physician cosmonauts would study animals; a spacewalk by a woman; and a spaceflight that would carry a journalist…. …..There were repeated delays in trying to organize Voskhod 3. Eventually, within weeks of its liftoff in May 1966, it was canceled. The decision was most unpopular among the cosmonauts. To save time and to prepare for the first flights of the Soyuz spaceship, the rest of the Voskhod program was terminated.."
This is not entirely accurate. Voskhod never had the ability to change orbits. What may have been referred to was the plan to have a Voskhod tethered to the last stage of the launch vehicle. The idea was to try to create artifcial gravity by rotating the two graft around a center along the tether. It seems that the rumor mill of March 1966 mixed up all these planned flights, but they still seem to have been reporting something that was going on. So, the question remains, was there a countdown in March 1966 to launch Voskhod 3, and in particular what happened on March 10? On 10 February part of the State Commission for the flight convened and set the launch date for the dog flight to 20-22 February and the launch of Voskhod-3 for 20-23 March, during the Party Congress. At a full meeting of the State Commission on 17 February the Voskhod launch date was set at 22-23 March. Kosmos-110, carrying dogs Veterok and Ugulyok was indeed launched on 22 February. On 22 February the crew passed its final examination and was cleared for flight. Continued problems with the spacecraft and a busy launch pad at Baikonur caused the State Commission at its meeting on 3 March to delay the flight until 15-20 April. A meeting at Korolev's plant on 22 March set the launch for 20-22 April. Problems with similar boosters in late March and early April caused a decision on 6 May to put off the launch of Voskhod-3 until 20-27 May. However, a meeting of the Military Industrial Commission on 10 and 12 May debated whether to cancel the mission altogether, but still set the launch for 22-28 May. Continued doubts about the reliability of the booster led to a decision, on 16 May, to put off the flight until mid-July. There were still attempts to fly Voskhod-3 in the autumn, but after that the idea was quietly dropped as flight testing of Soyuz commenced with the launch of Kosmos-133 on 28 November 1966. Interestingly, the launch was never closer to actually happening than in May 1966 - not at the time of maximum rumours in the period early March to mid-April 1966. In the figure below the planned launch date is plotted as a function of the date when the plan was made (dark blue line). the purple line is the "now" line. When these two lines meet, the plan is realized (plan = now). The light blue dots show the rumoured launch date as a function of the date when the rumour appeared. Interestingly the "rumour curve" has the same shape as the "plan curve". Strangely enough the rumours were always based on old information. The leaks from the actual project seem to have had a 2-3 week delay. Only at the beginning of April were the rumoured launch dates reasonably close to the planned launch date (10 days difference). One really wonders what happened behind the scenes of Soviet media and their contacts with western news agencies! Hendrickx, Bart, The Kamanin Diaries 1964-1966, JBIS, Vol. 51, No 11, Nov.1998, pp. 413-440.